As the year draws to a close, we would like to take this opportunity to thank you - our members and other supporters – for the many accomplishments we’ve achieved together. Below are some of the highlights that your advocacy, outreach, expertise and support made possible this past year. Through widely sharing with your networks, 35 organizations have now signed on to show support for the Call to Action for Strengthening the Social Service Workforce to Better Protect Children and Achieve the SDGs. This advocacy tool makes recommendations at the country and global level for governments to initiate, lead and engage in dialogue with partners in order to strengthen the workforce and improve the lives of children and families. During the 5th Annual Social Service Workforce Week, members helped to encourage individuals and groups to take specific steps toward achievement of the recommended actions outlined in the Call to Action, and shared replicable examples from their organizations of ways they are supporting workforce strengthening efforts. To advocate for the workforce to achieve the Sustainable Development Goals, elements of the Global Advocacy Toolkit continued to incorporated into members’ national and regional advocacy efforts to bring greater political and programmatic priority for strengthening the social service workforce, particularly in the areas of ending violence against children, improving health and well-being and supporting refugees and migrants. 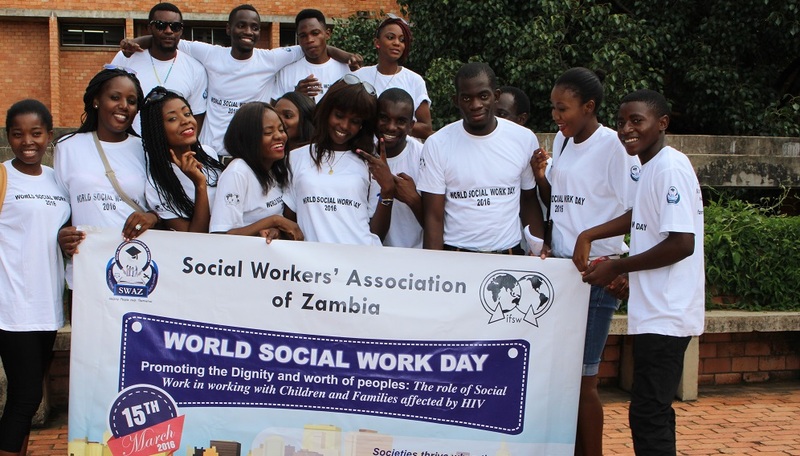 Alliance members participated in World Social Work Day events held around the globe. Alliance staff presented at the Social Work Day at the United Nations event in Geneva and Alliance Ambassadors presented on advocacy approaches at the CRISOWO Conference in Rwanda. Members with three regions contributed data and input into Alliance-led workforce mappings and assessments in 16 countries within the East Asia and Pacific region and nine countries within the Middle East and North Africa region in collaboration with UNICEF Regional and Country Offices. In addition, the Alliance completed a scoping of eight countries in South Asia, documented in the State of the Social Service Workforce in South Asia Report to establish a baseline of information and data on the workforce in each country to guide and assist country-level action plans toward strengthening the workforce. Members shared and responded to a survey to inform the State of the Social Service Workforce Report 2017: Stories of Workforce Efforts to Address Violence Against Children. This third annual report provides insight into workers’ backgrounds, training, education, services provided and organizational factors to demonstrate the value of multidisciplinary approaches to addressing violence against children. Alliance Members within the Interest Group on Case Management developed and released two new resources: Core Concepts and Principles of Effective Case Management: Approaches for the Social Service Workforce and a Compendium of the best existing tools, forms, training materials and other resources on case management. Five webinars were held over the course of the year, on topics suggested by members ranging from case management and ending and preventing violence against children to the role of a Council and workforce support to refugees. 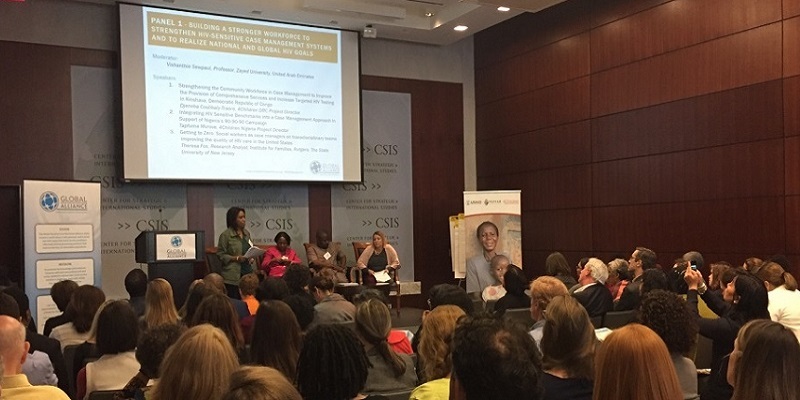 The Annual Social Service Workforce Strengthening Symposium featured partners and supporters sharing examples of how they have helped to elevate the discussion about the workforce, increased visibility and implemented strategies to strengthen the workforce. Through participation in mapping work, Alliance members and supporters helped convene or support formation of multi-stakeholder country task groups in more than 12 countries. In Uganda, Alliance Ambassadors and staff actively participated in the National Social Work Symposium for the launch of a national social service workforce strengthening strategy. Through sharing updates and inviting colleagues, members helped the Alliance network to expand by 600 members and 20 countries, totaling 2,100 members in 131 countries in 2018, increasing the reach of the network and numbers of workforce advocates. The second cohort of the Alliance Ambassador program began in September, with 10 Ambassadors from 10 countries. The first cohort finished their two-year terms, contributing to formation of a national association of social workers, training social service professionals on improving disability inclusion in programming, drafting of a bill on regulating and licensing of social work as a profession, increased budget allocations for hiring more social service workers and development of a code of ethics for social workers. Many exciting efforts are underway and will be realized in 2019 through continued support by you - our members and partners. Through your input and participation, we continue to develop new tools and resources for a stronger workforce. The Alliance is developing a toolkit for UNICEF to support Country Offices in implementing the programme guidance on strengthening the social service workforce specific to child protection. The guidance will be released in the coming months, and the toolkit will be publicly released mid-2019 and include a tool specific to carrying out national workforce mapping, one of the most requested tools by our members. The Alliance's State of the Social Service Workforce 2018 Report will include a multi-regional analysis and assessment of the workforce. Data from the three mappings and assessments in the East Asia and Pacific, Middle East and North Africa, and South Asia, will be compiled for this report, which will be shared during the 6th Annual Social Service Workforce Strengthening Symposium in May 2019. 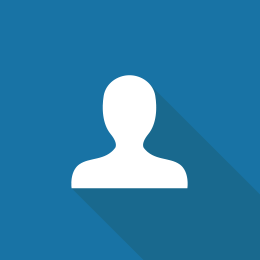 Members will have increased advocacy opportunities. A new advocacy interest group will launch in early 2019 for members to exchange effective advocacy approaches for greater political will and programmatic support to the workforce, and members will also be asked to participate in sharing how national plans of action are underway toward achieving the recommendations within the Call to Action. Additional details will be shared in the coming months. 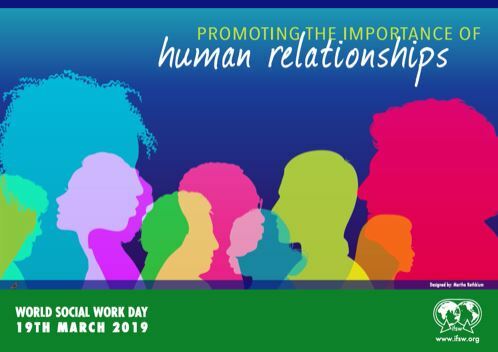 Through sharing knowledge and contributing expertise across the network, we all play an important role in contributing to a stronger social service workforce. As we enter the season of gratitude, we would like to express our appreciation to all of you - members, advocates and supporters of the Alliance’s work - toward building a stronger social service workforce that is best positioned to meet the needs of vulnerable populations. We are thankful to Alliance Steering Committee members, staff, Ambassadors, interest group members, consultants and the many others who have contributed their time and talent this year. We are thankful to our donors – USAID, GHR Foundation, UBS Optimus Foundation and UNICEF – for supporting ongoing and new work. We look forward to continued engagement to advance this work in 2019 and invite our members to join our circle of friends by donating to this work. Helping Children Worldwide has joined the Call to Action: Strengthening the Social Service Workforce to Better Protect Children and Achieve the SDGs because the ideas and recommendations reflect major goals of their programs in Bo, Sierra Leone. The organization supports the Child Rescue Centre (CRC), which provides education, health care, mentoring and programming to break the cycle of poverty for 600 vulnerable children and families throughout Sierra Leone. The CRC has been working for nearly 20 years to improve the lives of vulnerable children living in chronic, systemic conditions of extreme poverty by ensuring that they can attend school, have access to free medical care, and live safely in family, kinship and foster-based care, supported by strong case management. Additionally, the CRC provides families access to parenting workshops, life skills training, individual and family counseling, family strengthening activities, and access to financial literacy training and microfinance loans, to help families work toward self-sustainability. To support children at the CRC in continuing their education and developing professional skills, Helping Children Worldwide covers school fees and offers scholarships. Henry is one of those beneficiaries, who has returned as a social worker to work at the CRC and help the next generation. Henry’s story is unique in that he was a child supported by the CRC’s Child Support Program, which provided health and education support from primary through secondary school. After graduation, he applied for and won a Promise Scholarship which enabled him to attend university. Graduating with honors, Henry holds a Bachelor of Science in Social Work from Njala University. As the Assistant Coordinator for the Sponsor A Child program at the CRC, Henry is responsible for the cases of 70 children supported by the CRC’s programs. Henry credits being a CRC student with his path toward becoming a social worker. He was drawn to social work out of a desire to help people - particularly those who are most vulnerable. He has always been interested in community development and work has a deep, lasting and positive impact. Being a case manager for vulnerable children and their families helps him see that impact every day, he says. Henry finds the work at CRC particularly rewarding. In supporting CRC’s vision and focus, he is positively giving back to the community of Bo. The Child Rescue Centre is also pioneering implementation of best practices in transitioning child welfare programs from institutional care and orphanage model settings to family-based care within the community. Helping Children Worldwide and the Child Rescue Centre contribute to the knowledge exchange by working closely with the Sierra Leone Ministry of Social Welfare and Gender Affairs as well as with other child-focused NGOs in the Bo region and in country, by meeting regularly to share knowledge and best practices (focused on family reintegration and transition from institutional care, as well as compliance with global research and standards for robust case management) at a time when all residential children’s programs in Sierra Leone are making the transition to family-based care. The CRC is helping lead the way, and in June 2018 successfully reintegrated the remaining 20 students living in group homes in the community into family homes, foster or kinship care. Henry’s deepest hopes for the children on his caseload are the same as for his own two-year-old son: to do well in school, find a bright future, and know how deeply they are blessed by God to be in a loving family. Helping Children Worldwide recognizes that one way to strengthen families is to strengthen the skills of the social service workers, including social workers like Henry, who work with children and vulnerable families. HCW is committed to continuing to support the Child Rescue Center as it works to build capacity of social workers and case management staff striving to meet global standards in the care of children at risk. As Uganda places a stronger emphasis on community-based, family-oriented care toward implementation of a national alternative care framework, the Catholic Care for Children in Uganda (CCCU) initiative is supporting training religious caregivers within care institutions. The purpose of this training is to support family reintegration, prevent future family separation and ultimately end institutionalization within Uganda. CCCU is an initiative of the Association of Religious in Uganda and financially supported by GHR Foundation in Minneapolis, USA. The program goal is to strengthen Religious Institutes in becoming champions of child care reform and improving outcomes for children living outside of family care. For a smooth and effective community-oriented paradigm shift to community-based care for children, the CCCU program was launched in 2016. The program is currently working with 17 Religious Institutes operating 46 child care institutions (CCIs) with 1,773 children. Children enter the institutions largely due to family poverty and the mentality that children will have greater access to nutrition and education in institutions rather than remaining with their families. These families don’t understand the negative results of sending their children away to be raised outside of a family. The program is being implemented in three phases, from 2016-2021. The program began with a rapid assessment to determine the skills and qualifications of those running the institutions. A second assessment was undertaken to determine the extent to which the legal frameworks for child protection are being implemented. Both studies revealed a need for greater training and education for staff, as well as increased awareness on the negative impacts of institutionalization. To build the capacity of staff, 80 scholarships were awarded for education in social work and social administration. A total of 46 staff, one per institution, obtained a bachelor’s degree in social work, and an additional 17 staff are continuing to work toward a master’s degree in social work. Additionally, 176 Religious staff members were trained in a certificate course on protection of children that included learning about the alternative care framework and implementing effective case management practices. The trainings were conducted by professors in the Department of Social Work at Makerere University in partnership with the Ministry of Gender, Labour and Social Development. Phase IIis a two-year phase, from 2018-2019, that aims to ensure the 46 Catholic Care Institutions are exceeding the new standards set by the government for operating child care institutions. The program will support a few CCIs as a pilot to transition children to community/family-based care in preparation for mass program rollout in Phase III, which is expected to begin in 2021 and will support all 46 CCIs to align their work with the Alternative Care Framework and transition entirely to community- and family-based care. The Children Act, passed in 1997, is the overarching legal framework for the welfare and protection of children in Uganda. An amendment bill was passed in April 2016, and includes significant changes in the legal environment for the care of orphans and other vulnerable children. In addition to broadening of the definition of children’s rights and violence against children, there is a stronger emphasis on community-based, family-oriented care. This includes development of a stricter Alternative Care Framework that specifies a continuum of care and mandates that institutionalization must be a last resort. The framework defines six core care options in preference: (1) family reunification, (2) kinship and community care, (3) domestic adoption; (4) foster care; (5) inter-country adoption and; (6) specialized institutional care. A Deinstitutionalization Plan is also being developed and includes empirical evidence on the negative impacts of institutional care on the overall development of children, the increasing abuse and exploitation of children in child care institutions including child trafficking, and the higher costs associated with institutional care (Carter, 2005, and Walakira et al, 2014). If implemented, the plan will result in resettlement of approximately 64% of children currently in institutional care. The rules and regulations for approved homes were been revised in 2013 and made more stringent as far as approval and minimum standards for child care institutions are concerned. Legal liability is placed on individuals and organisations operating unapproved homes. Implementation of the framework and deinstitutionalization plan will result in immediately halting approval of institutions while a systematic assessment of existing ones is conducted, subsequently resulting in closure and more strict inspection of child care institutions by government. In anticipation of this and based on the principal law’s highlight on family-based care, these strategies are already being adopted and implemented into the current work of Catholic sisters and brothers caring for orphans and other vulnerable children. Catholic Care for Children in Uganda believes strong gatekeeping mechanisms blended with effective case management practices, skills that are being developed through social work studies, will prevent unnecessary admission of children into instructional care and prevent the prolonged, unnecessary stay of children in CCIs. This will not only contribute to de-institutionalization efforts in Uganda but also promote child protection by ensuring that every child is entitled to enjoyment of parental care and protection that is free of abuse, violence, exploitation and neglect.